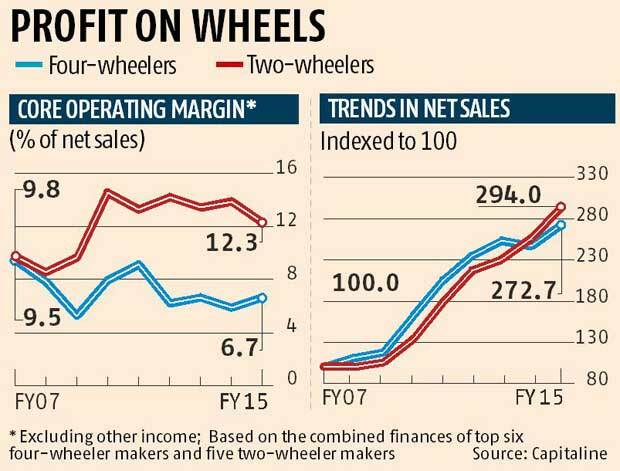 A recent analysis by Business Standard has revealed that the 2 Wheelers manufacturers are more profitable than the car manufactures. As we know the cost of owning a passenger car is pretty much higher than that of owning a 2-wheeler. When we look at the yearly net sales figures of 2-Wheeler OEMs and Car OEMS – Surprisingly the 2-wheeler manufacturers have surpassed the Car OEMs by a decent margin. It is very interesting to observe this dynamics of the Automotive Industry. Although there is a tremendous influx of Global Passenger Car OEMs in the Indian Automotive Space, many of the current players in the market are suffering with huge losses. This also indicates that way of incoming companies is not that easier. This analysis was made keeping the financial reports of Car manufacturers like Maruti Suzuki, Tata Motors, Mahindra & Mahindra, Hyundai Motors India, Honda Cars India, Toyota Kirloskar and Ford India. The reports from 2-wheeler OEMs like Hero MotoCorp, Bajaj Auto, TVS Motors, Eicher Motors and Honda Motorcycle & Scooters India were used while coming up with this report. The debts of most of the 2-wheeler manufacturers are under control and also have a very healthy balance sheet. When we look at the cars, the debt levels of Car OEMs are largely high. The high debt level which you see in the case of car manufacturers can be attributed by extremely high investments for setting up the manufacturing facility and investment on developing new products. Other than these taxes, from today onwards (June 1) the customer needs to pay additional 1% as Krishi Kalyan Tax (for cars >Rs.10 Lakhs). So it is not so ease path for Car manufacturers in India.